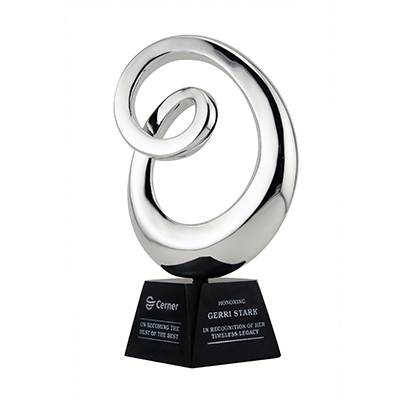 This contemporary designed chrome-plated resin sculpture on a back granite base is a mini replica of a corporate lobby artwork. An exceptional award to honor and recognize an exceptional individual! Included in the price, your text and/or logo are carved on two sides of the granite base and color-filled at no additional charge. NOTE: Plated resin may contain small imperfections not considered defects. This product ships direct to you.